Who doesn’t love a really good Philly Cheese Steak Sandwich? 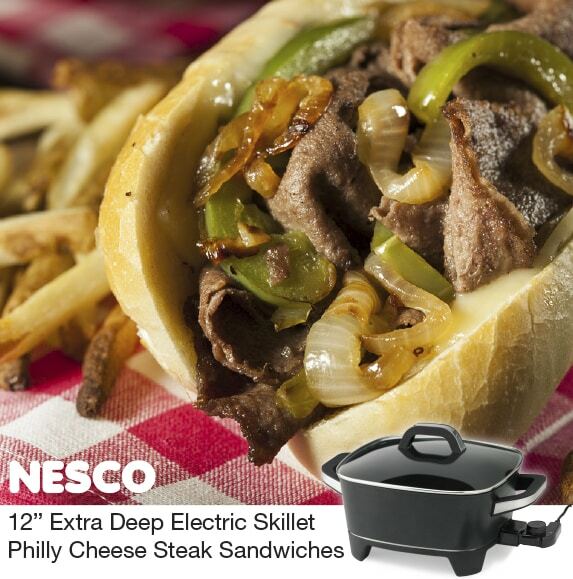 The 12″ Electric Skillet by NESCO® makes them simple and tasty. NESCO® Skillets are perfect for countertop cooking at home, in your RV or camper. Preheat Nesco® 12 inch Electric Skillet to 300ºF. Add oil and stir to coat skillet bottom. Add onions and peppers, cook for 2 minutes. Add water and stir until onion/pepper mixture is soft and water has evaporated (about 3-4 minutes). Remove mixture and keep warm. Warm buns until lightly toasted. Place 1 oz cheese on each warm bun. Increase heat in skillet to 350ºF. Season meat with salt and pepper. Sear each piece of meat 1-2 minutes per side until browned. *Note: overcooking meat will cause it to be tough. Place meat on cheese and top with onions and peppers. Optional: May use American, cheddar or mozzarella cheese if desired.